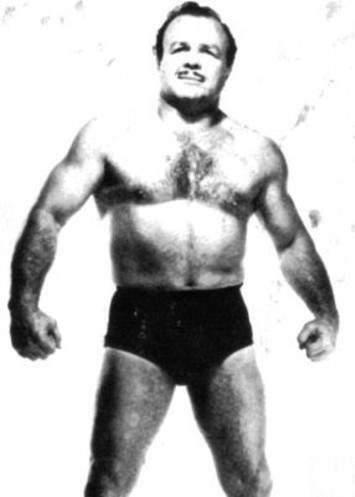 1950: Danny McShane married Sallee Lewin (sister of wrestlers Mark, Donn and Ted Lewin)..
November 1951: Danny McShane defeated Verne Gagne to capture the Junior Heavyweight Division championship..
July 14, 1992: Danny McShane passes away..
Philip Cmor wrote: Olympic in the 1950s. He was using the “Irish Cannonball” as his finisher — from a standing position, he’d grab one of his opponent’s legs as a lever and then do a jumping seatdrop, holding onto the leg to go right into a cradle. He always set up the move with a double-foot stomp.